That was the message from Cllr Tony Gillias (Con Revel and Binley Woods) who urged fellow councillors at this week’s Rugby Borough Council planning committee to vote against allowing three residential pitches and two day-rooms to stay on Top Road in Barnacle. 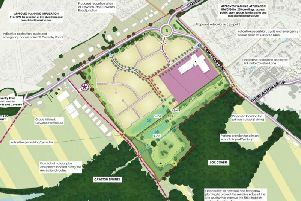 A second site containing nearly 30 pitches lies just 150 metres away from the one discussed at Wednesday’s meeting and Cllr Gillias said those living on the site were ‘playing’ the system. “Every one of the Gypsy and Traveller sites on Top Road has started out as an unauthorised site in the green belt,” he said. “It’s a wonderful thing the planning system because you can keep playing it until you get your full approval which is what has been recommended tonight. “There is nobody here from Barnacle village to speak against it because they have probably just given up entirely. “I can see that the cumulative effect has had an overwhelming impact on the settled community of Barnacle. There have been a considerable amount of people in the past opposing development and tonight we’ve seen nobody because they have lost faith in the whole system and the people who represent them. Planning officers explained to the meeting that there was a shortage of sites and, even though the latest application was in the green belt, they recommended it for approval - a decision that would allow the applicant and his extended family to stay on the site where they have lived for the last eight years. But councillors disagreed with the majority voting to reject the plan.